We supply a large range of interior trim to really finish off your car. We stock carpets, carpet overmats both in mixed wool and hardura, kick panels, furflex, moquette, vinyl, rear parcel shelf kits and a range of boot trim panels. A lot of the interior trim parts we can supply from stock, however, certain items are made to order, the description of the parts states if a special order needs to be placed. Lower B-post glove trim in moquette - to recover the shaped trim at the base of the B-post. Price ea.. Battery box cover in black hardura type material: P5 models It covers the battery that is located.. 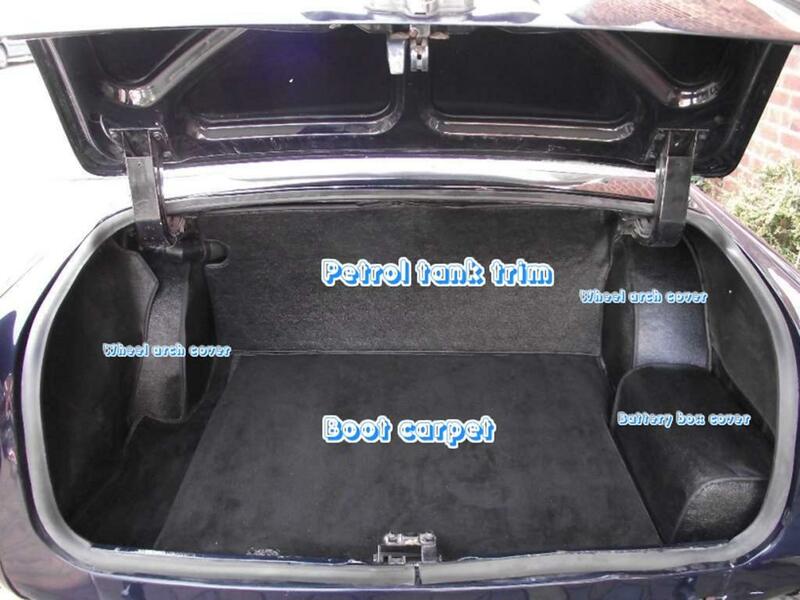 Boot carpet to replace the rubber mat: P5 3 Ltr / P5B models .. Boot right hand hardura trim: P5 models .. Boot toolboard and cover located on the LH side of the boot: P5 3 Ltr / P5B models This trim kit .. Boot toolboard cover only located on the LH side of the boot: P5 3 Ltr / P5B models Made in black.. Carpet floor fixing clip in stainless steel: P5 3 Ltr / P5B models OE Part No 355847 ..
Front drivers carpet in mixed wool with a sewn in moulded rubber mat: P5B RHD models Please speci..
Front passenger carpet in mixed wool: P5B RHD models Please specify colour when ordering ..
Front carpet set: P5B LHD models. One front passenger and one front driver's carpet in mixed..
One pair of front floor carpets: P5B Coupe/Saloon RHD models. One front passenger and one fr.. Carpet set complete: 3 Ltr models. High quality mixed wool carpet with bound edges and underfe.. Carpet set complete: V8 Coupe LHD models. High quality carpet with a sewn in matching moulded rub.. Carpet set complete, in mixed wool: P5B V8 Coupe RHD models. High quality carpets with a sew.. Carpet set complete, in mixed wool: P5B V8 Saloon LHD models. High quality carpet with a se..